We break disability stereotypes. What’s your everyday power? On Monday, November 6th, the Coalition of Persons with Disabilities will roll out our “Everyday Power” social media campaign, designed to raise awareness in our communities and challenge disability stereotypes. We’re thrilled to have selected more than 25 publicly-submitted submissions from members of the disability community to be featured in the month-long campaign. We’ll also highlight material the Coalition has created with the help of engaged community members. Each day this month, selected #EverydayPower video and photo stories will be featured on our Facebook Page, Twitter and YouTube. Be sure to follow us and check out who’s been featured, find out who’s won our weekly prize draw, and most importantly, add your voice to the conversation! 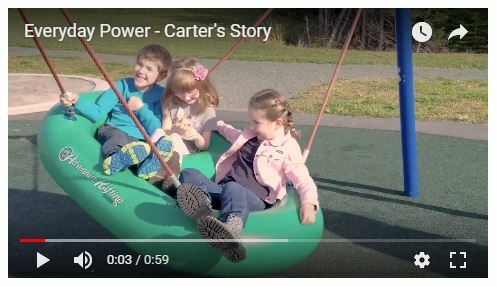 Click on the image below to be taken to our campaign launch video (“Carter’s Story”). Along with photographs and collages, we’ll be releasing a dozen video stories throughout the campaign, each providing a short, poignant snapshot of a positive aspect of everyday life for persons with disabilities. In doing so, they’ll share their experiences, break disability stereotypes, show their personal power and help build more inclusive communities. All contest qualifiers are now entered into our prize draw. No new submissions will be entered past deadline — but don’t let that stop you from participating and sharing throughout the month as we post daily! We’d love to see many more people interacting with us online with photos, videos and commentary. Simply follow us and use the #EverydayPower hashtag to join the conversation! Our #EverydayPower finale takes place on Monday, December 4th, right on the heels of International Day of Persons with Disabilities. We’ll top it all off with our grand prize draw. We want to sincerely thank all of those individuals who have participated in Everyday Power by sharing their lived experiences with disability — this act truly has the power to break barriers and to help create more inclusion in our communities. Finally, we want to thank our fabulous sponsors Sugar Mama’s Bakery, Jumping Bean Coffee, Fionn MacCool’s Eatery, Cineplex Avalon Mall, Waterwerks Communications and The Fisher’s Loft Inn. These accessible, local supporters have made accessibility and inclusion a priority and have offered their generous support to our campaign and cause. Be sure to check out our YouTube channel, Facebook Page and Twitter for more #EverydayPower posts, news, featured videos and prize draw announcements between November 6th and December 4th! For full details on Everyday Power, including a list of our fantastic, inclusive prizes and our generous sponsors, visit www.codnl.ca/everydaypower.